I love how life brings ideas for posts! Recently I was praying for my son and for him to be able to understand the leadership power he was given. Leadership power. That phrase seemed as if it jumped right off the page for me. My son is really into superheroes. He’s never watched anything on tv about them, and I don’t know that he’s even read anything about him. He’s a boy, though, and somehow boys eventually learn what a superhero is. Boys dream of being superheroes just like girls dream of being princesses. The cool thing is that God placed those dreams in us all at an early age, and he also equipped us to be the real version of both of those! Today, I want to hone in on superheroes. My sweet little 6 year old is like every other 6 year old in that he tests boundaries every time he turns around. It’s almost as though he enjoys getting in trouble, and I’m pretty sure he thinks it’s funny when he gets his little sister in trouble! I understand that kids do this, but I also understand that he has a calling on his life, and it’s his dad’s and my responsibility to help him stay within the boundaries he’s given so he can learn and grow in his calling. We’ve come up with any idea we can think of and have taken advice from many friends on how to get him out of the defiant phase he’s in. Unfortunately, we haven’t found anything that works. He knows exactly what’s right and wrong, but sometimes it’s more fun to him when he does those things he isn’t supposed to do. How about you? Do you find yourself rebelling sometimes? Maybe it’s with your parents, or your teachers, or your boss, or maybe you are just downright defiant to what you know God wants you to do. Read Romans 7:14-25 about struggling with knowing what’s right but still doing what’s wrong. You may find it to be parallel with something you’re going through. V14-15 So the trouble is not with the law, for it is spiritual and good. The trouble is with me, for I am all too human, a slave to sin. I don’t really understand myself, for I want to do what is right, but I don’t do it. Instead, I do what I hate. V18 I want to do what is right, but I can’t. I want to do what is good, but I don’t. I don’t want to do what is wrong, but I do it anyway. Does that sound familiar? I remember the first time I read this, and my eyes were opened. It was almost a relief to see that someone in the Bible wrote exactly the things I felt! We’ve read this scripture to our son, and we’ve talked to him about the plan God has for him to be a leader. We’ve even explained that it’s up to him to decide whether he will be leading people in the right direction or wrong direction. Of course, he always says he wants to lead in the right direction, but we haven’t seen the effects of that yet. I think the problem is that he knows all the answers to our questions, and he understands the difference in right and wrong, but he’s never been able to make the connection on what kind of power he holds by having that leadership calling. I think we made a connection last night. Last night, I sat with my son and explained to him, again, that God called him to be a leader and that he is already a leader right now. Then, I went on to tell him that he has what is called leadership power, and that’s his superhero power. Finally, I got his attention! So the first thing he has to decide is if he is going to be a good superhero that helps people or one of the bad guys that the superheroes are always fighting off. Of course, he wants to be the good superhero because they always win. With his powers, he will teach his friends to be whatever kind of superhero he is. I knew he was interested but still hadn’t completely made the connection, so I took it a step further. “Let’s test your powers,” I whispered to him last night. His eyes grew wide because he realized I wasn’t pretending he was a superhero. I was telling him that he is a real superhero. So I went on to tell him that he should try for the whole week to test his powers by doing what he knows he’s supposed to do. I knew he needed an example of how to test his powers. “When you are in Spanish today and Johnny* does funny things, and you really want to laugh, you can decide you’re not going to look at him. Instead you’re going to look at Señora Nice Teacher* and listen to what she’s saying and do what she tells you to do. You’ll get to come home with your sticker because you did the right thing! Somehow that was exciting to him. I went on. By then, he was excited to try it. He felt . . . well, powerful. We’ll see if it works, but I do know that this was the first connection he had made to the countless hours we’ve talked to him about obeying and being a leader. Okay, so it’s your turn. What is your power? Call it what you want: talent, gift, calling, plan, purpose, it doesn’t matter. What is it? Now, how can you test it? Spend a week testing it. I bet you’ll see how powerful you are if you stick to it for one week without veering off path. Is your power talking to others in a way they feel special? Test it. Find strangers at lunch, and sit with them. Listen to them and talk to them. Watch how special they feel. Then, watch how special they make others feel. Is your power making people laugh? Find the appropriate time and seek out someone whose spirit needs lifting. Watch how they lift someone else’s spirit in a few days. Is your power leadership, like my son’s? Take his test, but make it fit into your life. More important than anything is that you’ll find it’s not about you. When you test your powers and use them regularly, not only will they grow stronger, but you’ll find others are being positively affected. In turn, they might begin using their own powers. What powers do you hold? How will you use them today? What a great post! I think I will start over this week and use the talents and leadership skills God has blessed me with…..I just bet God will show up! You’re welcome! I actually wrote this last week and am happy to say that he did a great job “testing his powers.” He came home Friday and said he messed up a little and got a warning, but I just explained to him that the reason we continue to test and practice using our powers is to help them grow stronger. Sometimes we mess up, and that’s okay as long as we know we messed up and realize we want to do better next time. The more we practice using our powers, the less we find ourselves messing up because they’ve gotten so strong. This really opened my eyes as well it did to your son 🙂 This was the first day of ACU’s new semester and it wasn’t just a coincidence I read this today, I needed to read it and just puts all things in order and how I should be towards others. Also it made me think about the power God gave me and how I should be using it everyday to Glorify him. When we come into the light (ie: when we come into Christ) that’s when the real battle begins. That’s when we struggle between doing what’s good and what’s bad. When you asked your son to test his powers, and you gave him an example such as not choosing to look at his friend but to pay attention to the teacher, you brought him into the light. Now, it’s going to be a struggle for him because he has to decide between the old way of doing things as he knew it and the new (right) way of doing things. This all ties into the Romans ch 7 scriptures you mentioned. Furthermore, Apostle Paul says that we’re fighting a war between principalities and powers, rulers of darkness etc… (I know that’s a scary topic but stick with me… 🙂 Everyday we as adults have that same struggle. And for those of us who are in Christ, who know the light and the truth, therefore more is expected of us. Romans 8:5 says, “Those who are dominated by the sinful nature think about sinful things, but those who are controlled by the Holy Spirit think about things that please the Spirit.” We have to realize the super powers that we’ve been given by the Holy Spirit to do what’s good, righteous and pleasing to the Holy Spirit. When we chose to not give into anger, wrath, impatience, sin, etc, we’re exercising the powers that the Holy Spirit gave us. Therefore, we do hold the powers to do what is right and to be led by the Holy Spirit. This gives me a chance to work harder with the powers that God has given me. And put them to practice this week and beyond! Thank you, Misty, for sharing! As my son has just turned 8, I felt the need to go back to this post. It seems like I had this conversation with him just a few months ago. Time sure does fly. 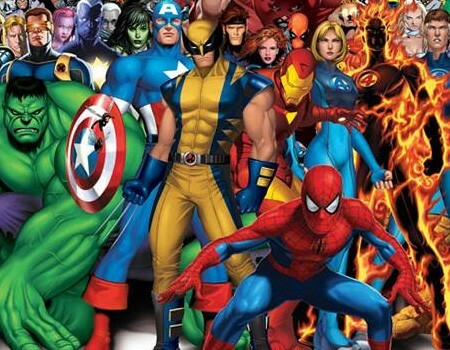 Have you figured out what Superhero Power you hold? Did you realize you have the power to be a superhero?